Many Canadians are rushing to get their Pleasure Craft Operator Card (PCOC) before boating season starts in earnest. Since September 2009, anyone operating a motorized vessel (including a sailboat with auxiliary engine, or dinghy with motor) in Canada needs to have one of these cards, which requires you to pass a multiple-choice test of basic knowledge of boating, boating safety and the “rules of the road” on the water. 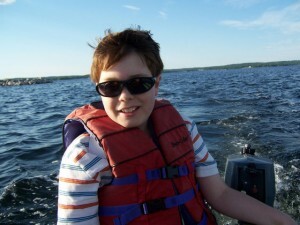 The card requirements have been phased in over a few years, but now everyone needs one, even experienced adult boaters. Courses are being offered by various groups, including the Canadian Power and Sail Squadrons (CPS), where I got mine in 2003 as part of their more in-depth Boating Course. CPS now offers the basic Boat Pro course geared towards the PCOC exam. My husband and 9½-year-old son recently took theirs together with a local instructor, Michael Ernst, who used the curriculum developed by the Lifesaving Society. At one point during the course, everyone put on red and green labels for port and starboard, and moved around the room practicing Collision Regulations — a great idea that caters to different learning styles. There are online courses available, or you can study the materials on your own and write the standardized exam online with a supervisor. Exam challenges are also held at boat shows around the country. Taking a course in person, however, is more fun and allows you to ask questions and learn from other people’s experiences. There is a special PCOC exam for kids under 12. My husband and son, as well as the instructor, thought that it was actually harder than the adult exam as some of the questions were not explained clearly. Price for a course ranges from $30 to $85 or more, depending on venue costs and what the instructor charges. Some people are obviously making a business out of providing this course, while others such as the CPS instructors are teaching voluntarily. If you’re looking for a PCOC course, check your local recreation centres and guides, yacht clubs, bulletin boards, or look online. There may even be an ad for one or more on this page.